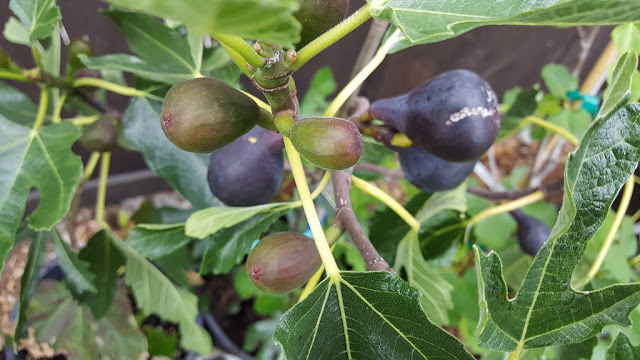 Seattle Garden & Fruit Adventures: What figs will produce reliably grown outdoors here in Seattle? What figs will produce reliably grown outdoors here in Seattle? As part of my on going trials on fig growing here in Seattle. I have amassed a large number of varieties. 225 is the last count. But because we have sooo many "made up" names out there I'm sure the actual number is close to 100 or less true varieties. Read my Post on "Whats in a name"
There are some figs that have 10 different names. I truly wish that folks would do their research before making up a name of a fig. I too have made the mistake when I asked a forum member to help ID the Gene's Vashon fig. I was initially told that it was called a "Vashon Violet" when it was really the Gene's Vashon. Vashon Violet is really a brunswick. And the variety I have is way different from a Brunswick. Anyhow, I love collecting figs but I'm also tired of maintaining so many pots and plants. So my goal from the beginning has been to grow figs that do well here in Seattle. In most cases it means looking for Figs that have a great Breba crop. 1. Violet De Bordeaux - Very great producer of Brebas the 1st year I put it in ground. 9. Desert King - My favorite breba! I only want to keep a handful of figs that require protection. Specifically those that have a taste that makes it worth the extra effort. It's a short list.